It wasn’t your typical job interview question, but Brett Laureys ’95 didn’t think much of it when he first met with associates of Wiss, Janney, Elstner (WJE) in Northbrook, Illinois. He had grown up in a construction family and was familiar with climbing around scaffolds at low-rise building sites. No big deal, he thought. “But when you get in a harness with a lifeline, and you’re riding up the side of a building that isn’t three stories, but 60 to 80 stories, it’s a different ball game,” Laureys admitted. After nearly 23 years with WJE, dangling on a window-washer scaffold or rappelling off the side of a building has become routine. WJE engineers, architects and materials scientists provide restoration and repair solutions to existing buildings and structures. Laureys’ expertise is in historic masonry buildings—brick, stone and terra cotta. He manages large-scale restoration projects from investigation through repair design and construction. Laureys, center, received a 2018 Alumni Achievement award at Summer in the City. He is pictured with MSOE President John Walz and Alumni Association President Sarah Alt. As a principal at WJE, Laureys finds the projects he wants to work on, then manages and staffs the jobs. He said it’s like running his own business with access to all the firm’s resources. Laureys has evaluated hundreds of structures, as far away as Buenos Aires. He rappelled from the top of the Missouri State Capitol building to inspect it’s 100-year-old stone dome, and hovered over high-rise terra cotta projects in Chicago and Miami. One of his favorite projects was the full architectural and structural restorations of the iconic Administration Building and Research Tower designed by Frank Lloyd Wright for S.C. Johnson in Racine. “Every building is different, and there’s a lot of creativity involved in coming up with different repair schemes,” he said. Laureys figured 950 feet is about the highest he’s risen on the job. “Between the safety harnesses and the safety lines and all the OSHA-type requirements, it’s probably safer than driving a car, honestly,” he said. His father was a mason and influenced Laureys’ love for “getting his hands dirty and fixing buildings.” He said MSOE was able to take that hands-on approach and frame it with a practical architectural engineering education. Laureys played baseball all four years at MSOE. The university is also where he met his wife, Denise Stanford Laureys. They now live in Diamond Lake, Illinois, with their daughter and two sons, ages 14, 12 and 6. Over the years, Laureys has found time to come back to MSOE to talk with students and give presentations. It’s an experience he’s found rewarding both personally and professionally. He said he’s noticed how the administration, staff and professors have strived to offer more opportunities for alumni to return, and he’d like to encourage more alumni to get involved. 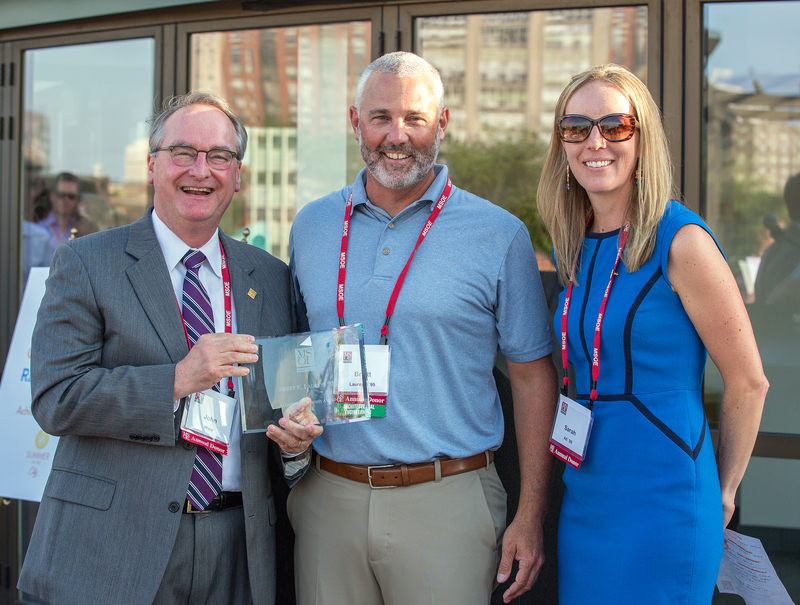 Laureys received an MSOE Alumni Achievement Award at the 2018 Summer in the City alumni reunion. 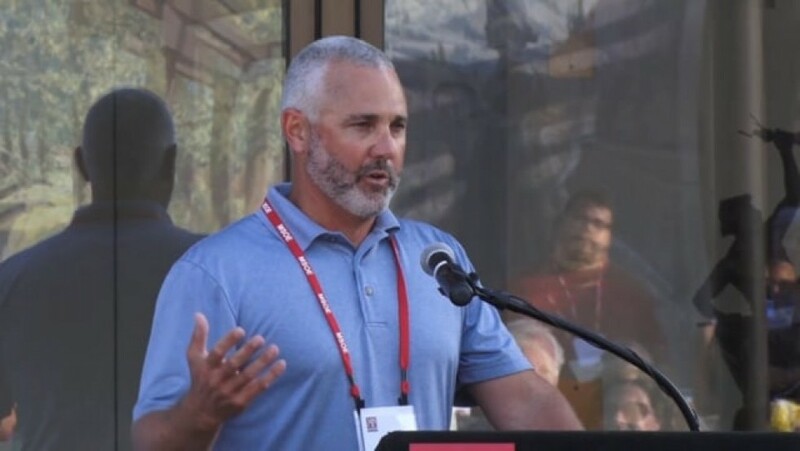 At the 2018 Summer in the City Alumni Reunion, Brett Laureys was one of three alumni to receive an MSOE Alumni Achievement award. Laureys graduated from MSOE in 1995 with a bachelor's degree in Architectural Engineering, and is now a principal at the firm of Wiss, Janney, Elstner, Associates, Inc. He was introduced by former classmate and now MSOE professor Dr. Christopher Raebel, from the Civil, Architectural, and Construction Management Department at MSOE.